Free Shipping – BlackCyberSaturday Sale – Through December 31, 2013! Where you going to find the best deals? Black Friday? Small Business Saturday? Cyber Monday? You don’t have to wait! We are proud to announce FREE SHIPPING on all orders over $25.00 now through December 31, 2013. This is our way of saying thank you for all the support you have shown. Remember, your Hyundai deserves a gift too. Hyundai Accessory Store would like to wish you a Happy Thanksgiving and a safe holiday! This entry was posted in Hyundai, Hyundai Accessory Store on November 21, 2013 by hasblog. Give your new Tucson an added amount of style with our custom-fitted Rear Spoiler. This color-keyed spoiler is built to Hyundai’s OE specifications and is designed to complement your new Tucson’s appearance. Can not be combined with any other offer. Limit one coupon per order. Offer expires November 18, 2013 11:59pm (EDT). Please call 1-800-852-4216 for complete details. 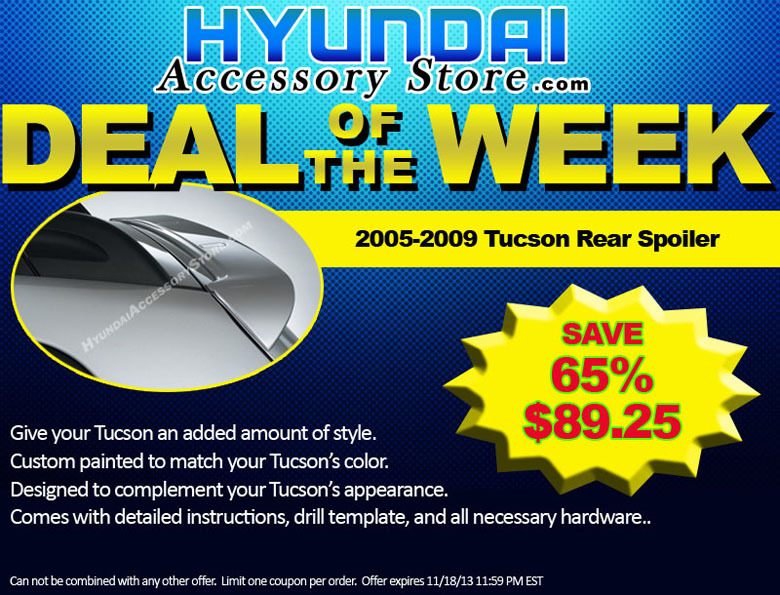 This entry was posted in Hyundai Accessory Store on November 12, 2013 by hasblog. Keep groceries, sport gear, valuable and fragile items from roaming around the trunk area of your Hyundai. 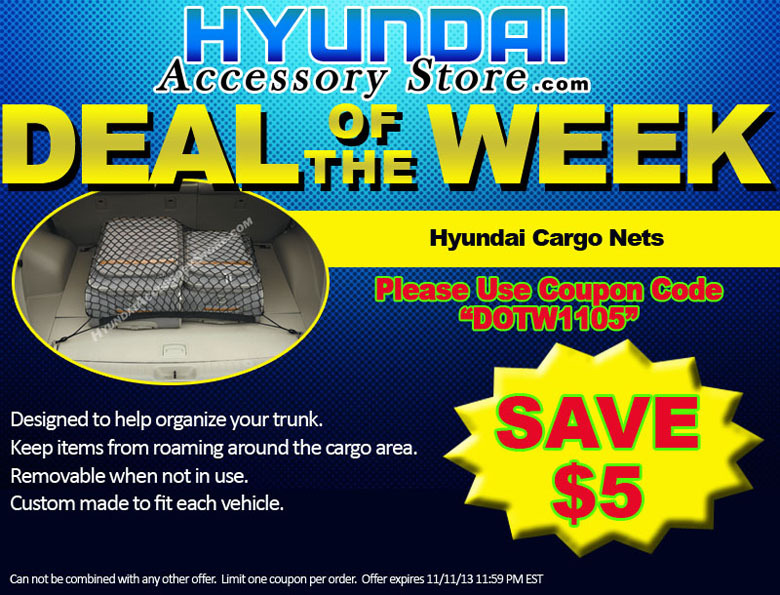 This cargo net was designed to help organize your trunk area while allowing easy access to your stowed possessions. Can not be combined with any other offer. Limit one coupon per order. Offer expires November 11, 2013 11:59pm (EDT). Please call 1-800-852-4216 for complete details. This entry was posted in Hyundai, Hyundai Accessory Store on November 5, 2013 by hasblog.